Stacie Bryson accepting Outstanding PLT Teacher of 2009 with Dave Walters, TFA member. Stacie Bryson, Kindergarten teacher at Short Mountain School in Cannon County, was recently named Educator of the Year by the Tennessee Forestry Association. Stacie was presented the prestigious award for her outstanding use of trees and nature in teaching language arts, math and science to her kindergartners. Besides being a tremendous teacher, Stacie was acknowledged for being part of a team that correlated Project Learning Tree activities to the Tennessee Department of Education’s new learning standards, and for her work in co-facilitating a teacher workshop on using outdoor activities to improve student achievement. 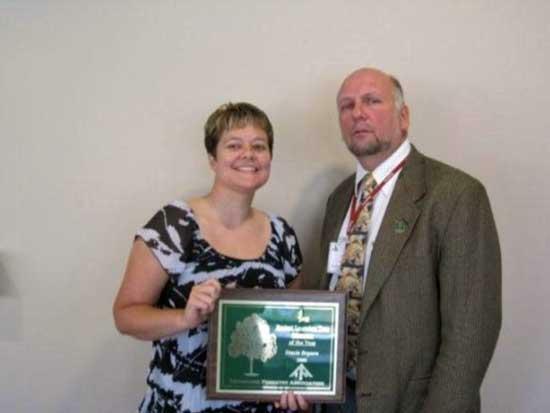 Stacie received her award at the Forestry Association’s convention just after State Senator Delores Gresham, addressed the group about legislative priorities. Senator Gresham is chair of the Senate Education Committee and spoke about the importance of improving education in Tennessee. In her acceptance speech, Stacie explained that her school system puts a lot of emphasis on literacy, and she has adapted her teaching to incorporate science into her language arts curriculum. She told the group of forest enthusiasts that science is our best opportunity to do fun, hands-on lessons with students. “Ms Bryson was selected from a list of outstanding Tennessee educators who use nature to inspire wonder in their students”, explained Candace Dinwiddie, Executive Director of the Tennessee Forestry Association (TFA). “Our non-profit association is dedicated to promoting a better understanding and appreciation of the forests of Tennessee and we appreciate excellent teachers who use the forest to inspire and teach”, she added. TFA partners with the Department of Education and the Department of Agriculture in. sponsoring Project learning Tree in Tennessee. Way to go Stacie! Just one more reason why Cannon County is the best place to be!